It is no secret that turntables and vinyls are making a comeback. I may own a classic 1970s Goodmans that I inherited, but I am not the only one with a massive vinyl collection at home. In fact, the last few years has seen a massive vinyl revival. Records have always been a lot more expensive than other media, and somehow that means that they end up being a lot more precious. Accordingly, turntables have also been a bit more expensive. 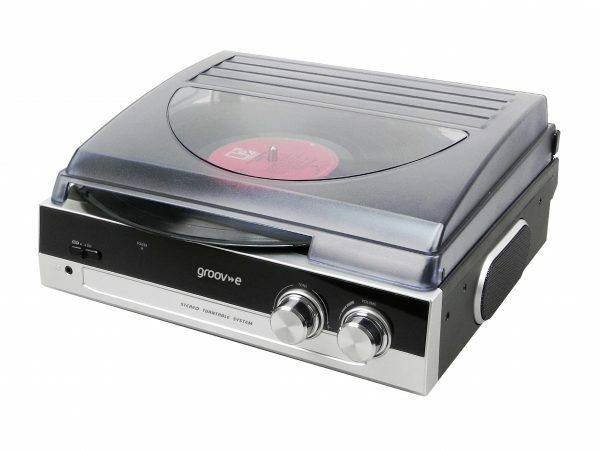 However, Groov-E is about to change all that, by offering the Vintage Turntable for only £40! 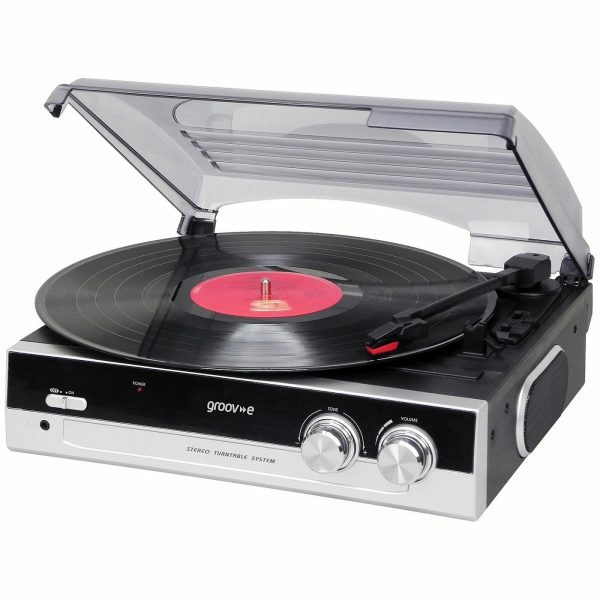 Designed to look like something from the 80s, this device is ready to let you get in the groove with all your vinyl! The design is heavily inspired from the 80s, with its bold black and silver looks. Both sides feature speakers, while the front has silver knobs for volume and bass, as well as an on/off button and a headphone socket. The back features an RCA Line Out socket as well as the mains cable. The top of the unit has a plastic cover that can be lifted to put the record in or out. It has slots on the side to cater for full sized records. Lift the lid and you see the turntable which takes records of all sizes. The needle arm has a little tab holding it in place. Slide the tab open, and you can lift and place the needle on the record. The needle also comes with a small protective cover to keep it safe. Behind the arm is a small attachment that can be used for smaller records. Along the needle arm is an adjustment tab for 33 or 45 RPM. There is also a control for AUTO STOP next to it. The design is simple and basic, with functionality over glamour being the main focus. No major setup is needed apart from removing all the packaging and plugging it in. To play a record, just place it on the turntable, turn it on, and place the needle on it. Make sure you have selected the right speed. From there on, the music should flow. The usage is remarkably simple. The turntable also boasts an auto stop feature, which means that when you get to the end of the record, it will automatically stop. This prevents the turntable from spinning when done and prevents your needle from wearing out or damaging the record. It does mean that if the arm is resting in its slot, the turntable will not rotate till you left it. All in all, quite a handy feature. And so, how does it sound? The beauty of vinyl is that it seems to carry with it a bit of a heavy sound, a bit of a roughness. This comes from the etched grooves of the records, and in a way, the turntable produces them rather well. The sound is loud and clear enough for both new and old records, and the needle behaves well. The bass knob means that you can add a bit more breathiness (or a bit more drums, depending on what you’re listening to) to your sound too. It won’t blow you away, but that is not really what this system is about. Also, for something under £40, this is amazing. More information can be found on the Groov-E website. It is available from various online retailers such as Amazon. It retails for £39.99. This is probably one of the best devices at this cost out there, and a simple no-brainer for anybody who wants or owns vinyls. Will you be getting this? Do you own any records? Are you part of vinyl revival? Let us know in the comments below!